Every photo has a story behind it, maybe silly, maybe serious, and Zoner Photo Studio X is here to help you pass that story on. Peruse the options below to pick the best way to share your photos. Then enjoy the fact that you don’t have to admire them alone anymore! The simplest choice of all. Went on a holiday with friends or attended a family event? There’s a good chance that more than one person shot pictures. Share them with each other safely and easily using links created in Zoner Photo Studio. 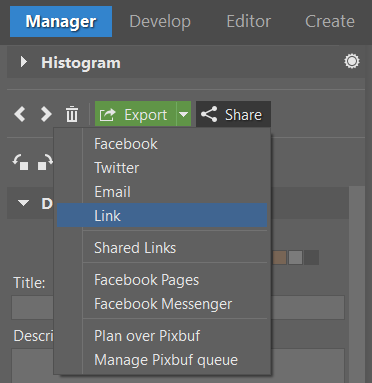 Pick the photos you’d like to send, then click the Share menu and then Link, and a private link will be generated. This link will lead to an album that your gang can download whenever they want. And you can delete it at any time! Use Facebook or Twitter? Then this option is perfect for you. Choose your photos and roll out the Share menu (see the point above). Only this time, click Facebook or Twitter in that menu. You will need to log into your Facebook or Twitter account if you haven’t used this feature before. Write your comment, hit Send, and you're done! Share your photos on the free Zonerama galleries straight from Zoner Photo Studio X. Click the photos to publish, then drag them into the Zonerama album you want. You can choose between private and public albums, so it’s up to you who will have the privilege of seeing your photos. Zoner Photo Studio X brings the opportunity to create physical photo objects in the new Create module. 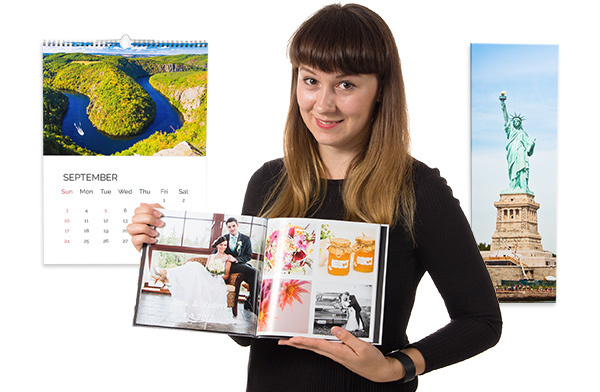 Photo books, calendars, and prints—all of these are great for sharing photos with your loved ones. They can make a fancy gift, or a better-looking alternative to ordinary photo albums. Make your postcard in the Create module. Send real personalized postcards with your own photos on them to anywhere in the world. Pick a photo and write your message. Then just add an address, and we’ll take care of the rest! Last, but not least. Show off your photos in a full HD video presentation! Add effects, set the time for each photo, and spice it up with music. It’s an original, fun way to publish your photos. You can prepare your first video in the new Create module. Whichever way you choose, you’ll be feeling the joy of shared memories. Start showing off your photos to the world today!